For those who know me, know that I just love creating paper crafts with a bit of flair for shabby chic, retro, vintage, and just plain aged pretty. Well, they have a style name for this: Grandma Chic. At first, I thought the name was a bit crazy. But, now that I have mulled it over in my head and have said it out loud a few times, I think I will embrace it! Grandma Chic, is my style of paper crafting. 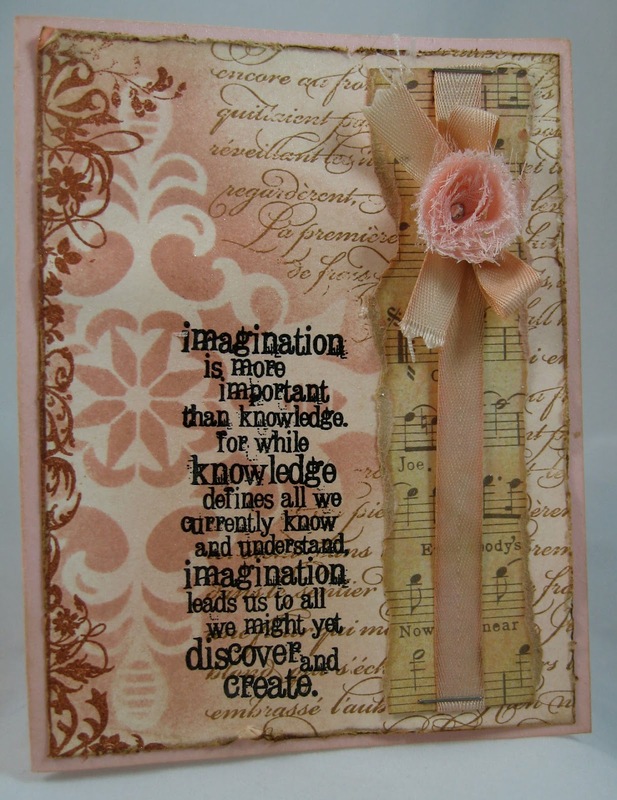 So, with that, the super talented Linda C. (the Funkie Junkie) has a fabulous challenge for you this week over @ Our Creative Corner, show us your favorite Tim Holtz technique. Sounds pretty easy, right? Well, if you are like a lot of the folks in the paper crafting industry, you know who Tim is. You could probably pick him out of a line-up. I know that I could. So, to pick one a technique, huh? Well, I couldn't select one, but rather I did a few. The two main techniques I used for this card, are the distress ink and masking. For distress ink, you are suppose to swipe your distress ink pad across your craft mat and spritz with water. I don't have a craft matt, or a blender tool. So, I altered the technique, so I could work with his products. I took tea dye, tattered rose, and antique linen ink pads and sponged the inks in circular motion across the whole piece of vanilla card stock. To create a variance in colors for my background. I lightly sprayed the inked card stock with water to help the ink blend. And heat set the inks with my heat tool. Now, for the mask. I held the Mostly Vintage template from Stampin' Up! in place and took tattered rose distress ink and a sponge and used the ink to highlight where the mask was. I held the mask in place and inked my En Francais text stamp from Stampin' Up! with brushed corduroy distress ink and stamped the text along the opposite edge of the card. I used vintage photo distress ink to stamp the flourish image along the left side of the card. These two stamps come from the Flights of Fancy TH stamp set. I had a scrap piece of a music sheet from Lost & Found 2, so I tore both edges. 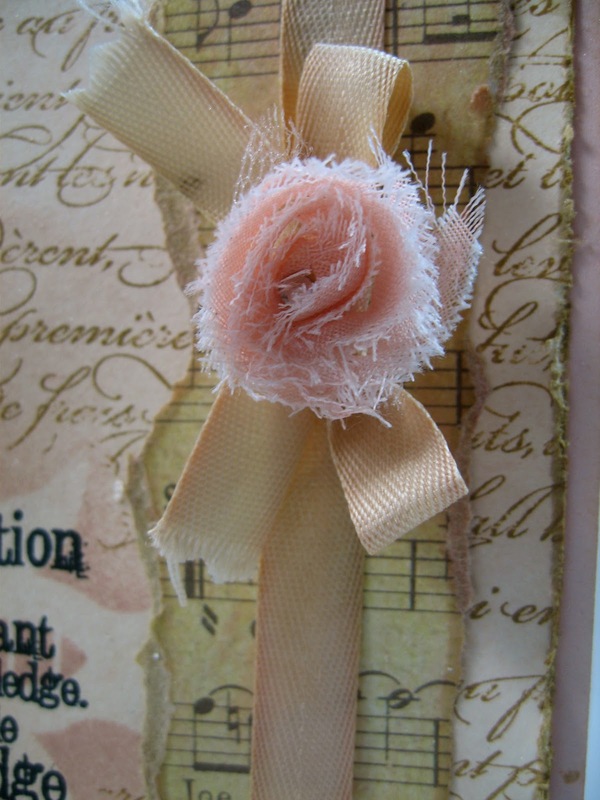 Then I swiped antique linen and tattered rose distress inks along all the edges and across the face of the paper. I used a piece of Fine Linen Twill tape ribbon from PTI, and distressed it with the same distress inks. I used the blade of a pair of scissors to fray the ends of the twill tape ribbon. The fabric blossom is a single blossom cut from TH Lavish Trims. I spritz the fabric blossom with water and than swiped the tattered rose distress ink pad across the fabric. Once I had enough ink on the fabric blossom, I sprayed more water on the blossom to help blend the ink. I added one rhinestone jewel to its center. I couldn't figure out where to add my metal embellishments, like Tim does, so I just stapled the twill tape at each end. This also helped secure the ribbon to the card front. I used a thread cutter to distress the edges, and swiped both brushed corduroy and vintage photo distress inks along the edges. I used Sweet Blush card stock from PTI as my card base. My goal when I was creating this card, was to keep the card true to Tim Holtz fashion, but to make it a bit girl-y. And I believe that I have done that. Now, won't you give our challenge a try? I We would love to see what you create! And who knows. Maybe you'll be our next Top Talent winner, and be a guest designer! Wow! You do "grandma chic" so well! Beautiful! You must have had the chic-est Granny around!!!! This is eye candy, even with cataracts!!! Absolutely stunning...and you so rocked these techniques perfectly especially for not having all the tools!!!! Kudos! First time for me to hear this title too, I probably fall into this category. The masking on this card is very effective and eye-catching, and your colour palette is warm, soft and feminine, a lovely card indeed.